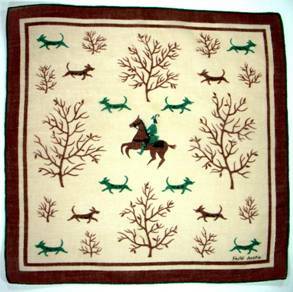 In years past, November signaled the start of hunting season when skilled horsemen and trained hounds teamed to hunt a clever and equally skilled fox. 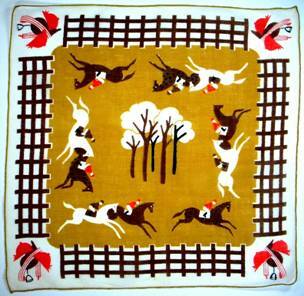 In these glorious fall handkerchiefs, a pack of hounds is used to track a wild stag. Perfectly framed, the artist achieves maximum impact with minimal color, foreshadowing the colorless coming of winter. 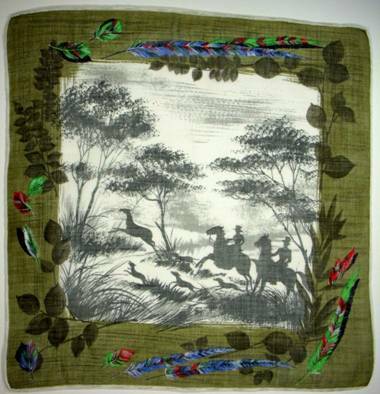 Again, the artist renders the hunt solely via shadow and silhouette. 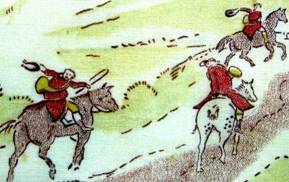 This stag chase may have commenced at chilly daybreak, or equally plausible, the hunt could be shrouded in the evening mists at dusk. The brilliantly hued pheasant feathers add the perfect zing of color, and underscore the frosty, waxen onset of winter. 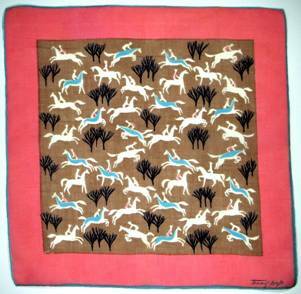 Practitioners of Game Theory know ‘Stag Hunt’ also describes a game that studies the conflict between safety and social cooperation. 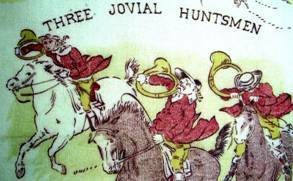 Jean-Jacques Rousseau, David Hume, and others have opined on the ‘hunt’, along with Bryan Skyrms, author of The Stag Hunt and the Evolution of Social Structure. But I digress… (Okay, wait. I find game theory fascinating, so for those so inclined, I’ll add a bit more at the end of the blog) Meanwhile, on with the hunt! Mounting up for a weekend at the country estate. 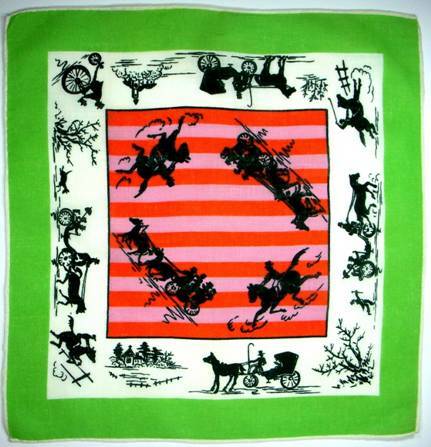 What a glorious hankie. It’s always interesting to note how just a slight change in color can seem to transform the image from spring to fall. The foreground remains calm and cool while riders in paprika coats sprint through the trees in hot pursuit. The posture of the crimson coated gentleman on the right confirms he’s too pooped to participate further. 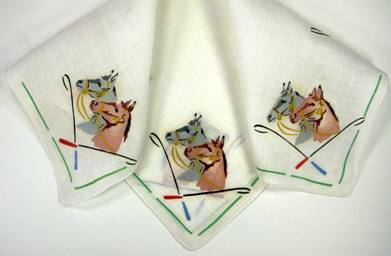 After all this color and excitement, let’s take a breather, and see what these equestrians might be carrying in their pockets – snowy linen with handsome profiles of their favorite steeds. 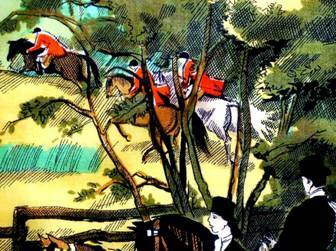 Introduced in America in the early 1800’s, the hunt had already existed in Great Britain for centuries. Only in 2005 was it outlawed, as it was deemed barbaric – not only for the fox, who didn’t stand a chance against packs of trained hounds and riders, but also by farmers, whose fields were trampled to bits. 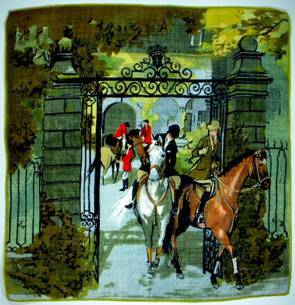 I love this hankie with the horn &hound border. The cool gray allows the red to really pop. I’m reminded of a fox encounter I once had along a road in Big Sur. Although we had large dogs with us, a young fox boldly sat at the edge of the road in plain sight, taunting us. He allowed us to get ridiculously close before he’d bolt. I thought to myself “That little scamp is going to get eaten if he doesn’t watch out.” Silly me. He was quicksilver personified, and the dogs were far too large to navigate the tangled manzanita bushes. The fox played with us for almost half a mile, continuing to reappear 30-40 ft. ahead, challenging us to catch him. 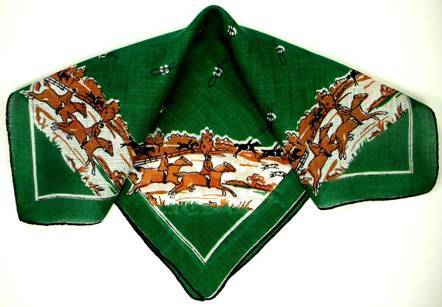 The fox’s brother appears to be holding court in the southeast corner of this hankie. 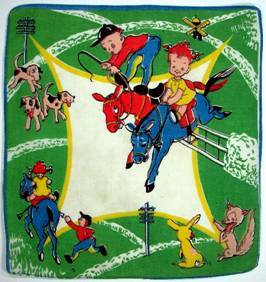 He can barely contain his glee as he points out the dogs wandering in dazed confusion, the ginger rider flying stirrup free, her feet swinging in the breeze, and the hapless chap destined to fly head over heels. 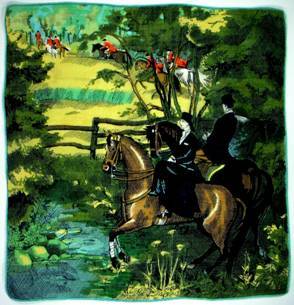 In Act II, we see the rider has lost his horse altogether and is hoping to hitch a ride. Not sure what the tiny windmill is doing there, but perhaps when the hunt is over, they’ll take in round of miniature golf. 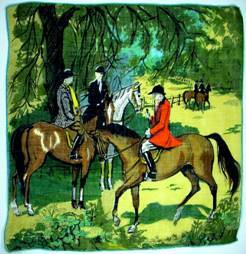 ..
Phalanx of hunter jumpers form a splendid pattern to please the eye whether in cool turquoise and grape or cozy salmon and cocoa. What equestrian wouldn’t want to carry one of these in her pocket? 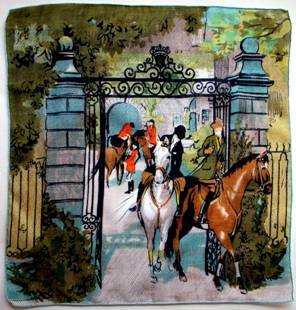 A brightly hued and happy handkerchief depicts steeds participating in everything from polo to the steeplechase, fox hunting to carriage ride. Although the images evoke the era of Jane Austen, the colors are as brilliant as a Warhol creation. Were Austen’s Elizabeth Bennet to stroll the landscape with Mr. Darcy, they might easily happen upon this bit of buffoonery, a rambunctious and rowdy trio. 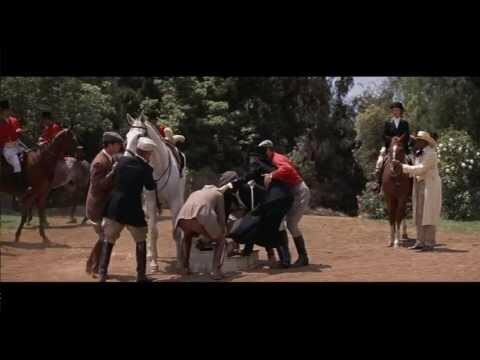 With horns blaring and hooves pounding, they resemble more a Monty Python parody of horseplay than a tribute to equestrian mastery. Great fun! 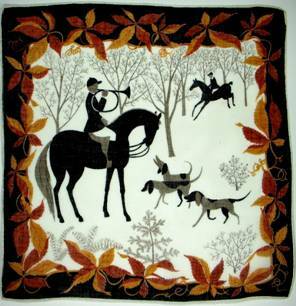 Although not part of the hunter jumper milieu, I had to include this stunning dressage rider and horse. Note the background of elegant spectator boxes and crystal chandelier worthy of the finest European opera house. Dressage is a French term which means “training” and is a centuries old traditiondating back to ancient Greece (or further). Originally devised as a method for training military horses, to help perfect disciplineand maneuverability, the art is beautifulto behold when rider and horse are one. 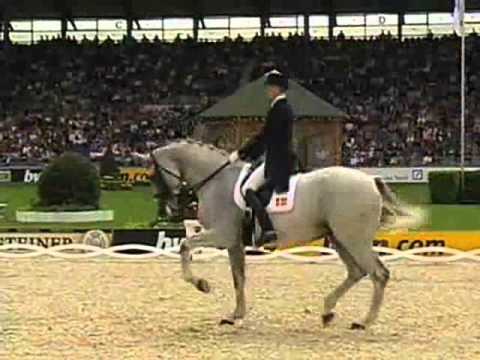 This brief dressage video is worth a look if you can ignore the crude hip hop lyrics. 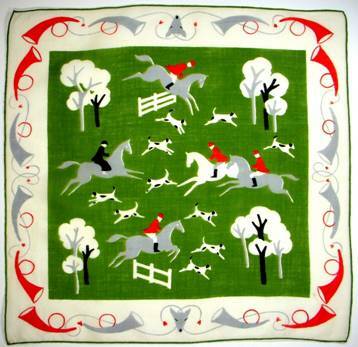 An equestrian fashionista’s handkerchief, perfect for both the impeccably dressed dressage rider and the hunter jumper galloping over hill and dale. Colorful, crisp, bold and beautiful. And with that we’ll tip our hat to horse and rider and bid adieu and Tally-ho! 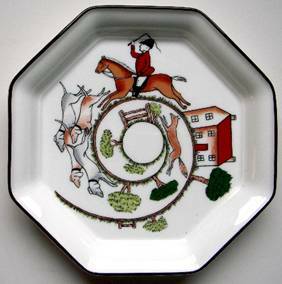 One of all time my favorite china patterns is Hunting Scenes by Wedgwood, and features a red coated rider and hounds chasing the fox round and round. We hope the wily red tail can escape to his fox hole in time. Those who have ever seen the movie Auntie Mame are already chuckling. In the story, New Yorker Mame (played by the fabulous Rosalind Russell) has captured the heart of the wealthiest and most eligible bachelor in the south. When Beauregard brings Mame home to the plantation to meet his mother, rival belles are determined to take this yankee interloper down. 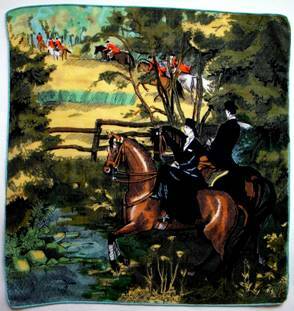 They set her up to ride in a fox hunt wearing boots too small, upon a wild stallion… side saddle! Ah, but never underestimate a woman in love, determined to make her man proud. Having read a book on ‘how to ride’, she’s determined to “Fix the animal in the eye with a masterful gaze,” as we cross our fingers and hope for the best. “The original stag hunt dilemma is as follows: a group of hunters have tracked a large stag, and found it to follow a certain path. If all the hunters work together, they can kill the stag and all eat. If they are discovered, or do not cooperate, the stag will flee, and all will go hungry. The hunters hide and wait along a path. An hour goes by, with no sign of the stag. Two, three, four hours pass, with no trace. A day passes. 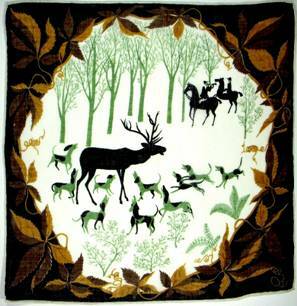 The stag may not pass every day, but the hunters are reasonably certain that it will come. 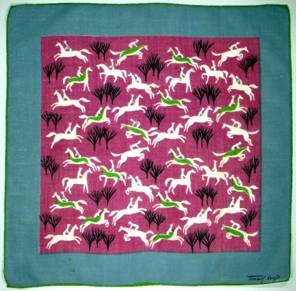 Suddenly, a hare is seen by all hunters moving along the path. Tally-ho is the squadron motto of the 609 (West Riding) Squadron, a famous British WWII fighter squadron which still exists today. What a delight this was reading and seeing all the unique hankies! Thank you! What a wonderful start to my morning. 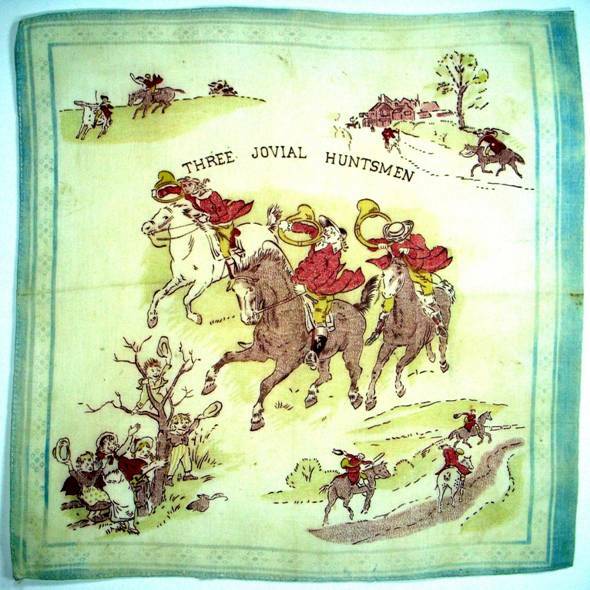 The handkerchiefs as always are outstanding and the history or stories to go with them. The time and effort and research you do is amazing. Thank you for sharing with all of us. 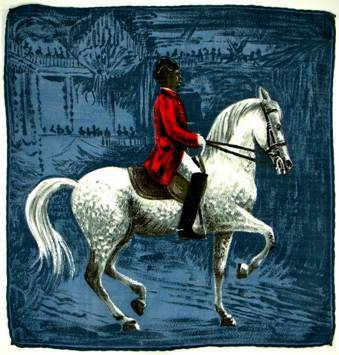 The handkerchief with the dressage rider is depicting a Lipizzaner horse at the Spanish Riding School in Vienna. The riding school is in the Hofburg, which is the formal imperial palace and explains the highly decorated background. Thank you for coming to Nocatee in Ponte Vedra. 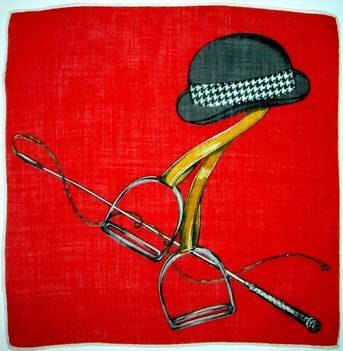 I was not aware of the symbolism and significance of the handkerchief and thought your presentation was very well done. Thank you for attending the presentation, and for all this wonderful additional information for our readers. Delightful!